Valentine's Day isn't just for lovey-dovey couples. It's a chance to celebrate some of the finest clients a local Tucson printer can appreciate. 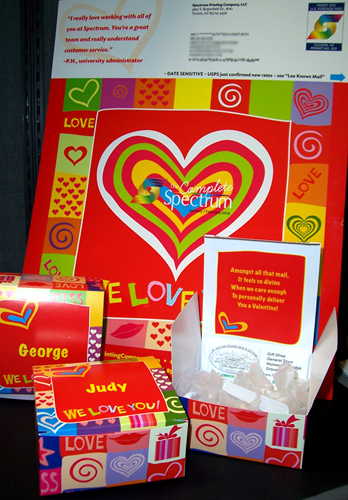 This year, we decided to thank our good, loyal customers with an appreciation marketing strategy of giving them a special treat from the heart... small, personalized PACKAGING / SPECIALTY BOXES of fudge. They were designed to match our over-sized Valentine flat from our most recent copy of our newsletter by mail, The Complete Spectrum. How sweet it is... or was, since just about every quarter-pound slice of delicate chocolate confection has left our hands by now. The interesting story behind this well-received small token of our appreciation started out with the idea that we'd send chocolate truffle valentines. Fudge wasn't even on our radar yet. However, we found ourselves in quite a tailspin when discovering that practically all of Tucson's local homemade chocolate shops had closed their doors. Even when we did find a local chocolatier, our order had been turned down--even with more than three weeks notice. Yet, we insisted on choosing someone local rather than conveniently heading over to the nearest wholesale warehouse to buy dozens and dozens of pre-packaged, commercialized truffles. Fudge finally entered our minds, freeing us of our local chocolate dilemma. It was then we recalled the smooth, tasty sweetness of Mt. Lemmon's very own fudge. Our belief in finding local chocolate was re-born. We were impressed with their "above and beyond" factor of what an exceptional customer service experience should be. We became happy customers ourselves, honoring another fellow local small business just like us. The reviews are in and all are delighted on the Valentine's Front. We couldn't be happier ourselves, making our clients happy and supporting the heart and soul of our very own Tucson business community. To all who support us, we simply say, "Thank you!"